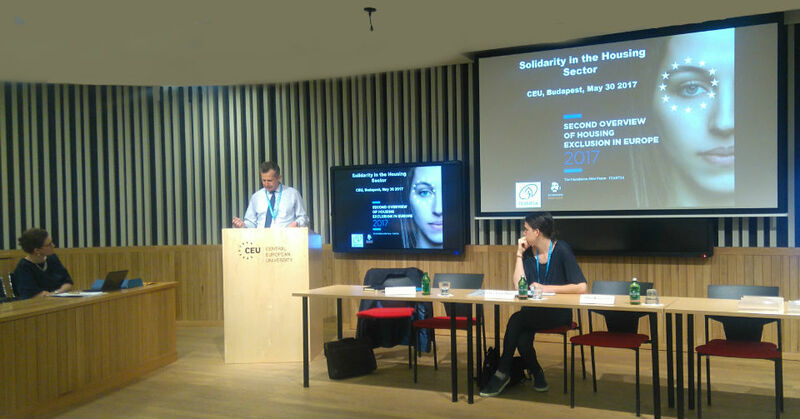 On May 30th 2017, it took place the second European Seminar on Solidarity in the Housing Sector at the Central European University (CEU) of Budapest (Hungary). The aim of the seminar was, on the one hand, to present the state of the art and present challenges in the policy area of housing in the European context and, on the other hand, to make visible the contributions developed by different solidarity actions in Europe, which are working for affordable housing access to the most vulnerable collectives. Introduced by Andrew Cartwright (CEU), the Budapest European Seminar involved civil society members, stakeholders and policy-makers working in the housing policy area. The first part of the Seminar was centred on the debate on accessing housing. In this regard, Orna Rosenfeld, consultant to the United Nations Economic Commission for Europe, introduced global data on the present changes that are taking place in the housing market and how this pressure is affecting the current percentages of social and urgent housing leading to homeless and exclusion to thousands of people all over Europe, as collected in the Overview of Housing Exclusion in Europe introduced by Chloe Serme-Morin of the European Federation of National Organisations Working with the Homeless (FEANTSA). Later, attendants have the opportunity to be involved in policy labs moderated by Balint Misetics (Central European University & Eotvos Lorand University) and Csaba Jelinek (Central European University & Hungarian Academy of Sciences) where meet the solidarity actions in housing analysed in the SOLIDUS project for Denmark (The Skovsgård Model), Greece (KYADA), Netherlands (Timon), Slovakia (Kojatice Social housing) and UK (Living rent campaign). In the policy labs it was discussed about the contributions of each of these solidarity actions in the access to housing for vulnerable collectives as well as how to transfer them to other countries and make policy recommendations to improve their situation in the field. The second part of the European Seminar was focused in holding on to housing for those collectives that affords situations of risk as a consequence of process of eviction. Then Kathleen Lynch and Manolis Kalaitzake (University College Dublin) started with some reflections on the financial pressure that banks are done in the housing market. Relevant for the debate was the contributions from the representative of the Mortgage Victim Platform (PAH, Tarragona), Liviu Catalin Mara, who show how a solidarity citizenship initiative created by affected by mortgages were able to stop more than 2.050 evictions. Later, Dr. Marta Soler, main researcher, presented some of the main findings coming from the analysis of the solidarity actions in housing that are affording social impact and were collected by the SOLIDUS project. This second part was completed with the presentation of the future objectives and lines of action establish to reach them by the European Commission, such as the European Pillar of Social Rights, introduced by Jozsef Hegedus, of the Metropolitan Research Institute, and Edit Lakatos, of HOUSING Europe. Gyorgy Sumeghy, of Habitat for Humanity, closed the seminar summarising its main conclusions.